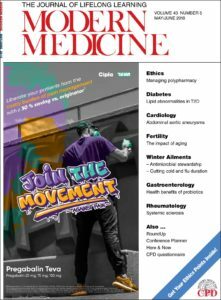 We welcome you to come and read through our latest, May/June, edition of Modern Medicine. This month we have a jam packed edition for you. Our features this month include; Ethics, Pharmacology, Dermatology, Flu and many more. We encourage all of our readers to complete the CPD questionnaire for this edition, this can be done on the answer-form included in the magazine, or on our website CPD system. Modern Medicine, the journal that’s with you wherever you go.